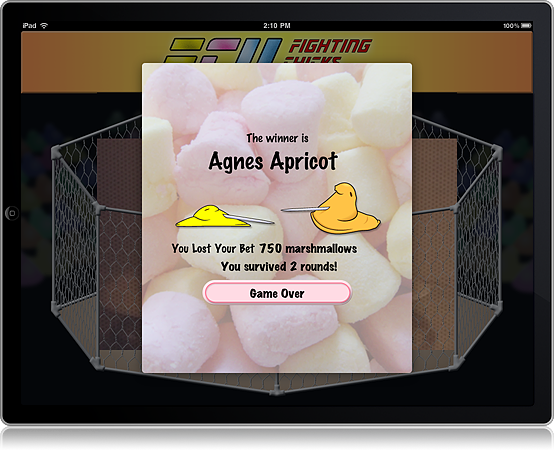 Fighting Chicks Unlimited -- Marshmallow chicks joust in the Septagon! 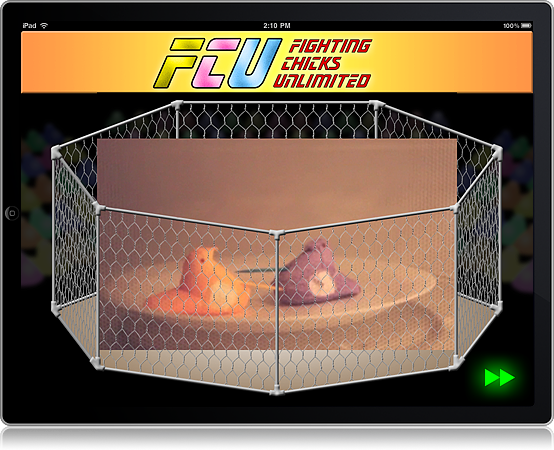 Marshmallow chicks fight for your entertainment in a caged arena. 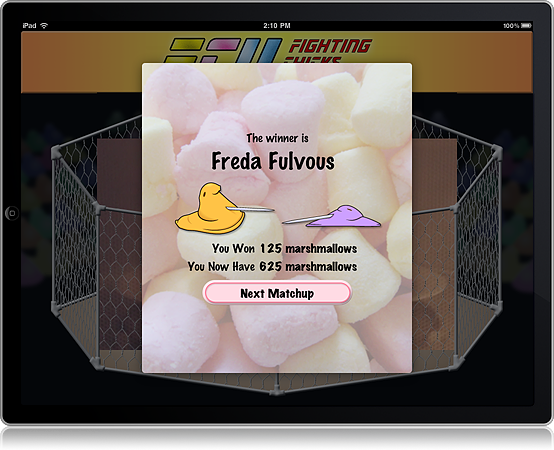 Can you spot the winners and add to your pile of mini marshmallows? Dozens of matchup videos filmed exclusively for this app. 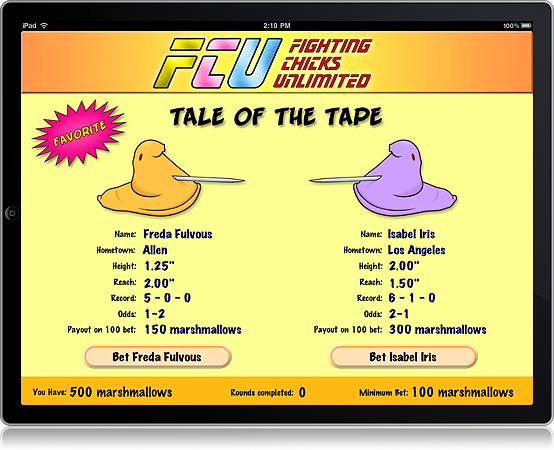 Matchups are weighted based on fighters’ stats. Win/loss records change to reflect outcomes during gameplay. High scores table with player initials; challenge your friends and family. 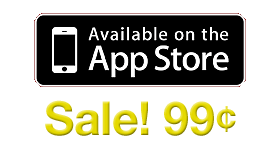 Universal app: play on your iPhone, iPod Touch, or iPad. 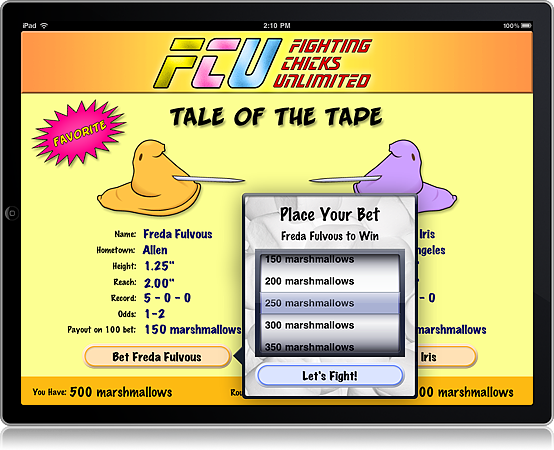 When played on the iPad, we take advantage of the larger screen to give you the full arena experience. 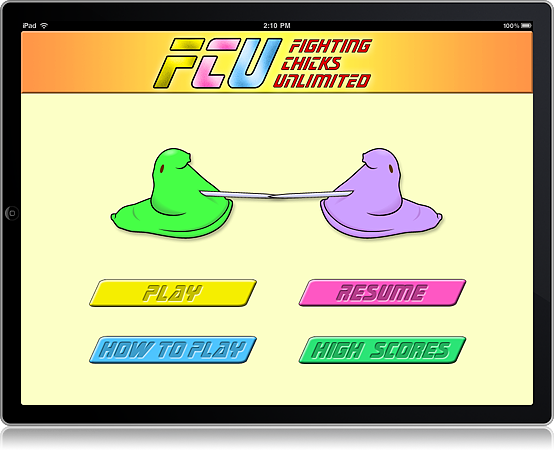 When played on the iPhone or iPod Touch, you can have Fighting Chicks Unlimited anytime, anywhere! Requires OS 3.1 or greater. Works great with OS 4! Two chicks enter, only one survives! 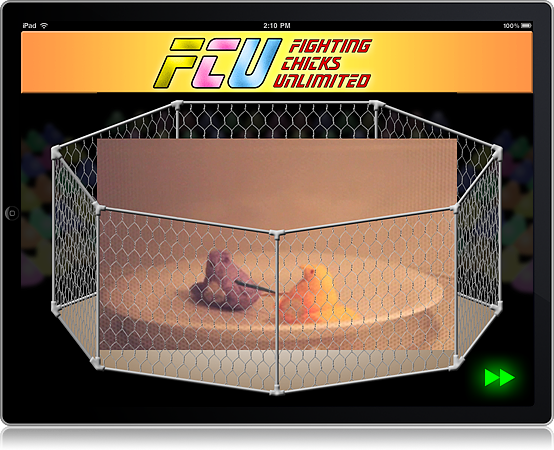 Marshmallow chicks jousting in the microwave Septagon! Even easier to play than it looks! Based on their stats, who do you bet will win? Enter your initials to be recorded for glory! How much are you willing to risk that you’re right? The chicks face off, spinning and expanding! One’s about to pierce the other! Victory is declared! The loser is deflated! Only two rounds? Surely you can do better next time! Will you defeat the current champion? For iPad, iPhone, & iPod Touch!